If you’re looking for a high-quality epilator, there are few options out there that can beat the Braun Silk-épil 9. It is pretty much the epilator on the market, from a brand who has been removing hair from people since the 1950s! Braun has been a leading name in the hair removal and grooming industry for their highly-rated, high quality products, and their epilators are no exception! Seriously, go on Amazon and search for epilators based on ratings, and you’ll see the Braun brand all over the place. Even after you decide you’re going to purchase one of these epic epilators, there is still another decision to make before you can buy, which model do you want? The different models all have the same base epilator, but come with different attachments and accessories, everything from electric razor attachments and bikini trimmers, to exfoliating brushes and deep body massage pads. Because I wasn’t interested in the shaving features, and wasn’t really concerned about massages with my epilator, I (or rather my husband who bought it for me), went with the 9-941e skinspa model, which still included a few nice accessories that I was pretty excited to test out. Pivoting head with 40% wider epilating area. There are many things to like about this epilator, here are just a few of the things that stuck out in particular to me. Very powerful motor. Although it was louder than I expected when I first turned it on, I can appreciate how powerful it is. Other cordless epilators lose power quickly or conserve power to length the battery life, but not this one. Even on the ‘gentle’ setting, it was impressively strong and worked great even on my leg hair, so I imagine the more powerful setting will do even better for those with thicker hair. Arrived already charged. You can ask my husband, I’m not what you would call a ‘patient person’. I hate when I buy something and it doesn’t include batteries or needs to be charged before using. Come on, I want to use it now! Although charging this epilator only takes 1 hour, I appreciate being able to use it right out of the box. Exfoliating brushes really work. I wasn’t entirely sure if I was going to use the exfoliation attachments that came with the Braun Silk-épil 9. SkinSpa sounds nice and all, but my concern was epilating. As it turns out, to get the best epilating results, you should exfoliate before… and when I did, WOW! My legs have never felt smoother! I joked to my husband that the difference makes me feel like I’ve never exfoliated in my life. I love the exfoliating brushes so much, I even use the gentle brush on my face. It also makes using my fancy bar soaps way easier, since the brush can lather up the suds way more efficiently than any loofah could do! Can be used wet or dry. Again, this is something that I thought was a nice feature, but didn’t really figure I would need. My plan was to epilate dry, and didn’t really consider letting it get wet. I’m an overly-cautious person, so even though it says ‘safe to use in water’ or ‘waterproof’, I did’t want to risk damaging it. I decided to use it dry first, which was a bit intense for a first timer like me. After one swipe, and reading the user guide, I wanted to try it wet instead. I have to say, each has it’s own pros and cons, but having the choice is great! Easy to clean. Because it is safe to use in water, cleaning out the epilator head as well as the exfoliating brushes is a breeze. Just make sure to dry it well afterwards! Sometimes, hairs might get stuck behind the tweezers, but I just use my old pair of precision tweezers to grab them right out. Smartlight shined a light on missed spots. The built-in light was actually a complete surprise to me. Despite the fact it’s mentioned as a feature on Amazon, I totally overlooked it. The light turns on automatically when you turn on the device, and turns off automatically with it as well. I had no idea how helpful the light would be in highlighting hairs I missed. Definitely a great feature! If hair is too long, it could be snapped instead of pulled. If you’ve ever epilated before, you know the rules and this shouldn’t really effect you. However, you could have issues if you aren’t aware that hair needs to be a certain length prior to epilating, otherwise it could be snapped instead of pulled. I had shaved about a week prior to my first time epilating with the Braun Epil 9, which was still too long, so make sure you keep your hair short to avoid this complaint. It takes a few passes to catch everything. Even with a 40% wider epilating head, it still misses hairs and forces you to go back over the same areas multiple times to remove all the hairs. With that said, this is an issue you’ll likely face with any epilator. The best way to avoid this issue is to exfoliate and shave a few days prior. Would I Recommend the The Braun Silk-épil 9? 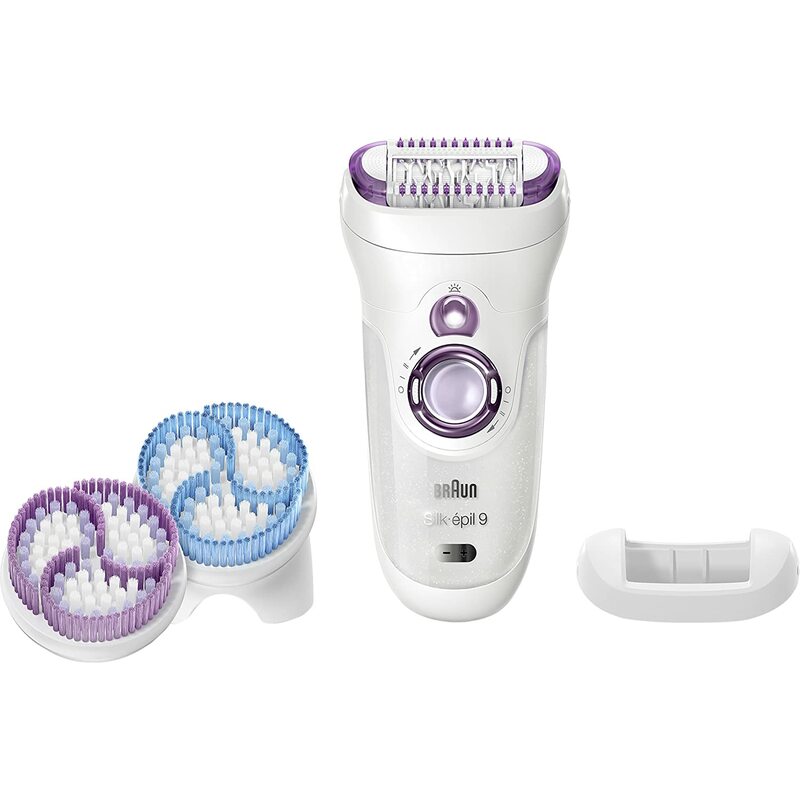 After using it several times now, I would absolutely recommend the Braun Silk-épil 9 SkinSpa to anyone interesting in epilating for the first time or looking to upgrade their current epilator. This is one of the best rated epilators on the market, and after using it, I can definitely understand why. The bigger question is which accessories are you going to get? I can’t comment on the other options out there, but I can say, those exfoliation brushes are Ah-mazing!